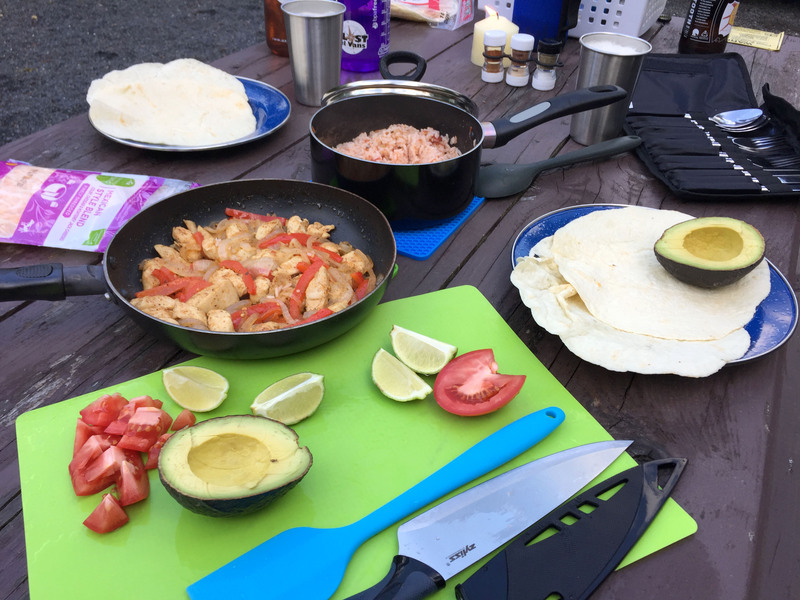 The techniques laid out in this recipe are intended to help you both plan and cook while you’re camping in one of our vans. Not only does cooking on a camp stove take a little finesse (they burn much hotter than the one in your kitchen at home, so finding the right temperature can take a bit of practice), planning meals and storing the ingredients also becomes a little easier if you figure out which ingredients can be used for more than one meal. Plus, that will also mean fewer leftovers, and much easier storage for the ingredients you do need to keep around. This recipe will make dinner for two and breakfast for two the next morning. 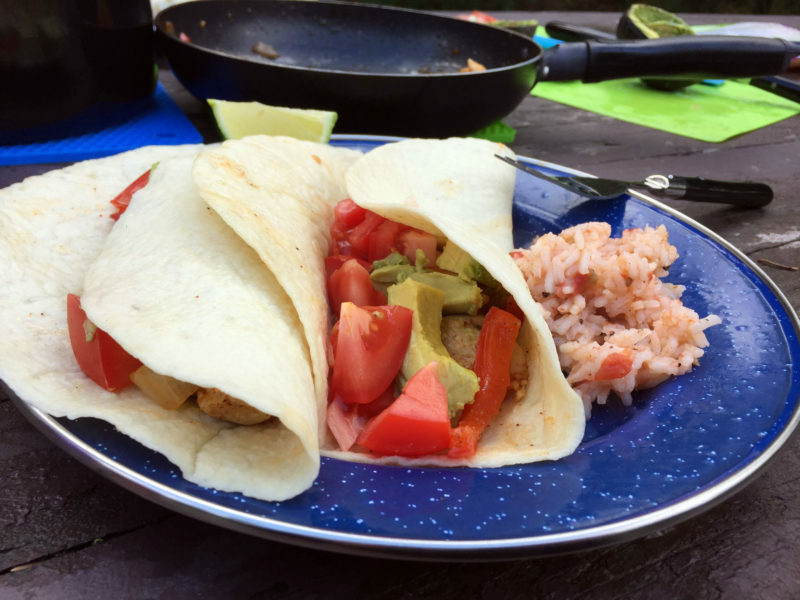 Also note: This recipe relies on the add-on spice kit, which contains salt, pepper, garlic, cinnamon, fajita seasoning blend and Italian seasoning blend. You are welcome to use your own spices! Bring about a half cup of rice and water to a boil. Use about twice the amount of water as rice. Stir and immediately reduce the heat as low as you can to simmer. Cook for about 8-10 minutes. Stir occasionally to make sure the bottom isn’t sticking. When all the water is absorbed, remove from heat and stir in about 1/4 cup of salsa. Cover until the rest of the meal is finished. Julienne or dice the onions and peppers. Reserve a bit of each vegetable for breakfast tomorrow. Add avocado oil and start to sauté on stove over medium heat (adjust the flame to slightly higher than simmer, but not much). Cut chicken breasts or tenders into strips and add to peppers and onions. Add the fajita spice mix to taste (there are about 2 tablespoons in the kit). Add extra black pepper if needed from spice kit (the fajita mixture contains salt already). Cut the lime into wedges, slice the avocado and chop the tomato. Make a quick guac if desired by mashing the avocado, and adding salt, pepper and garlic from the spice kit, and a little lime juice. Make sure the chicken is cooked thoroughly. Remove from heat and place inside tortillas. Top with cheese, tomato, avocado and salsa, and squeeze the lime over the top. Serve with rice on the side. Enjoy! Use the reserved chopped peppers and onions from dinner last night. Saute them in a little avocado oil on medium heat until they’re soft and the onions are transparent. Add salt and pepper from the spice kit. Crack the eggs into a bowl and whisk with a fork, and add to the onion mixture. Scramble until the eggs are cooked through, remove from heat and place into tortillas. Top with salsa, avocado and cheese, and wrap into a burrito. Enjoy! Remove as many of the food bits from the plates and pans into the trash before rinsing them in the sink. The drain in the sink isn’t industrial and could get clogged. Not to mention the fewer food bits, the better the gray water will smell when you empty it. Warm up the dish cleaning water: Fill the small pot (or the kettle) with some water and heat on the stove (even if it’s not clean). It doesn’t have to boil, so just a couple of minutes will be enough time. Plug the sink and add the warm water. Fill from the tap the rest of the way, or until the water is warm enough to plunge your hands into. If the stove is still hot, move it out to the picnic table to cool. Spread one of the towels on top of the stove platform and use this as your drying area. If the stove is cool, close it and spread the towel on top. Or, if you have rented the extra picnic table, use this as your drying area. Also, see this article for a few more tips on cooking on your camp stove.